By turning the shaft of the potentiometer, we change the amount of resistance on the center pin of the potentiometer, so as the voltage at the center pin. So the volatage is from 5 volts (except Arduino Due) is close to zero (resistance on the other side is close to 10 kilo Ohm). As we turn the shaft, the voltage at the center pin changes. This voltage is the analog voltage that we read as input. The Arduino microcontroller of the board has n analog-to-digital converter or ADC which reads this changing voltage and converts it to a number between 0 and 1023. In this project, we are simply using that data in programmatic way to make it looking like volume control knobs with LEDs with physical wiring to turn on/off LED. 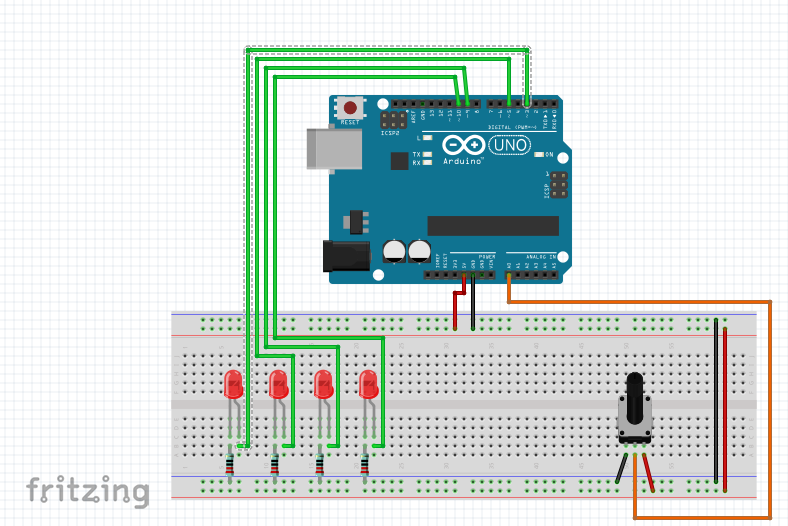 Cite this article as: Abhishek Ghosh, "Arduino : Make LED ON One at a Time Using a Potentiometer," in The Customize Windows, June 13, 2018, April 25, 2019, https://thecustomizewindows.com/2018/06/arduino-make-led-on-one-at-a-time-using-a-potentiometer/.